Stephenie Foster, founding partner of Smash Strategies, leads the 2018 AWEP participants in a business leadership workshop. While in the U.S., the group is meeting with government and business leaders as well as entrepreneurship experts. Their meetings address topics such as U.S. business practices and African access to U.S. markets, integrating African women into the global economy, and funding access for commercial expansion in Africa. These women are leading actors in economic growth and social advocacy in their communities and countries. AWEP’s alumnae have created thousands of jobs and established more than 20 women’s business associations across the Sub-Saharan region. I worked with this group as they crystalized their professional and personal goals for the IVLP and made concrete plans to use new contacts and skills when they return home. We discussed the challenges they face as business leaders and women and the centrality of developing strong leadership and communication skills. 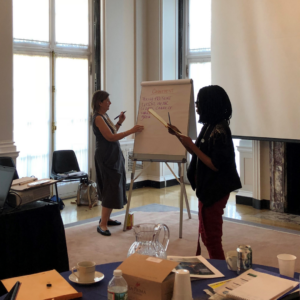 The group brainstormed about how to address their challenges as leaders, managers, and innovators; how to successfully confront gender norms and policies that can hold back women’s economic success; and how to effectively exercise authority. This post was contributed by Stephenie Foster, Founding Partner of Smash Strategies, who led a workshop for the 2018 AWEP participants. POST TAGS: Africa, AWEP, Empower Women, Entrepreneurship, Social Entrepreneurship, Stephenie Foster, women.